Zarda rice is very popular in India, it is a special dish in Mughlai cuisine. on special occasions like EID, people make it and serve it as the main dessert. 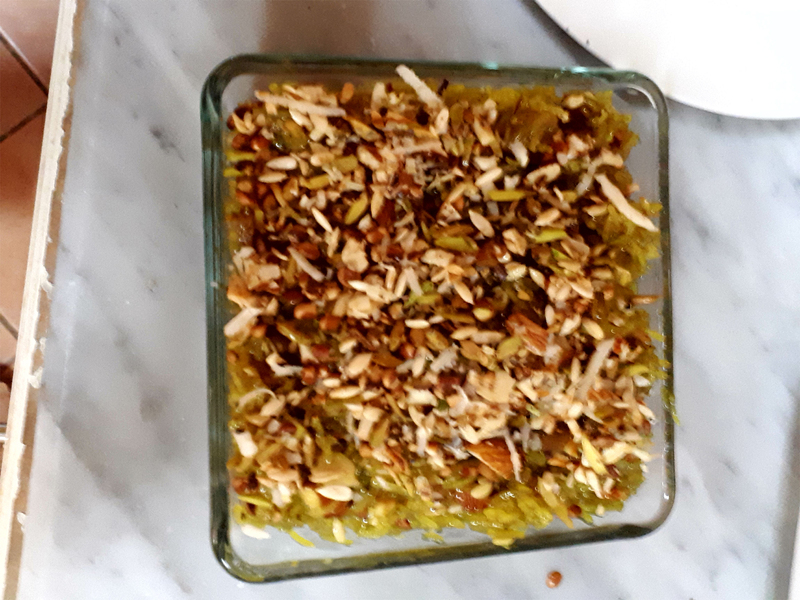 Rakhi (Raksha Bandhan ) is on Monday, so I will be making zarda rice on this occasion for my son and daughter because this is their favorite dish. First, soak rice for an hour then drain water from it.Then heat 2 1/2cupswater in a deep pan. add one tbsp turmeric powder and rice.Rice cook to be cooked only 3-4 min not full. Heat1 1/2 tbsp ghee in a pan and saute all dry fruits, set aside. Heat 4-5tbsp ghee in a heavy pan add cardamom powder, rice, sugar and saute it.cook 5-10 minutes, mix saffron and add half of roasted dry fruits. Garnish with remaining dry fruits and roasted sliced dry coconut.